That's right, it is already February of 2018! I've said it before, and I'll say it again- wow does time fly! I hope your holiday season of 2017 was a happy one. February means a lot of things; it means we are well into "High Season" down here, so all the snow birds and visitors are here. Our season was affected in many ways this year by hurricane Irma- so that continues to be a big learning experience for me. Also our winter weather for part of December, and all of January has been like a REAL winter! We experienced most days starting in the 30s and 40s and ending in the 60s, with tons of strong wind, and it even snowed in Tallahassee! But things are slowly getting back to normal around here. I am very busy with work and trying to keep up with inventory, as well as balance house guests and visiting with all the neighbors that have come back! February also brings some milestones- I had a big birthday last month, and it has given me even more determination to do new things, and new experiences. I love my work, don't get me wrong, but reaching 50 made me realize, time really does slip away, and even while we have to work,we can still make some time for adventure too. I think we all need to make the most of life- and remind ourselves of this often! So I went fossil hunting for the first time since I've been here! It was GREAT!! We got tons of really great fossils, including fossil MEGALODON teeth! What a great day! More of this will absolutely be in my near future! I am also planning a crystal mining trip too. 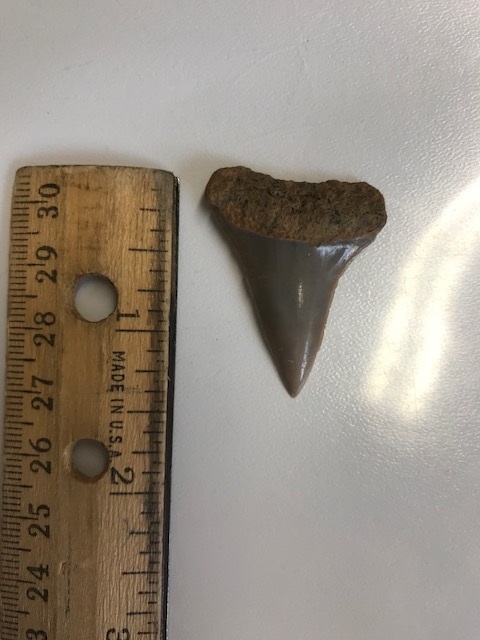 Frank even found a fossil MAKO tooth in our yard this year! He was digging for the new driveway and sidewalks around the house he had installed, and found a shark tooth! The month of February also means that Valentine's Day is in just a few days! 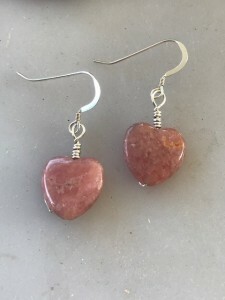 In addition to making some gorgeous new heart pendants, I also have a brand new item; heart shaped rhodochrosite earrings! 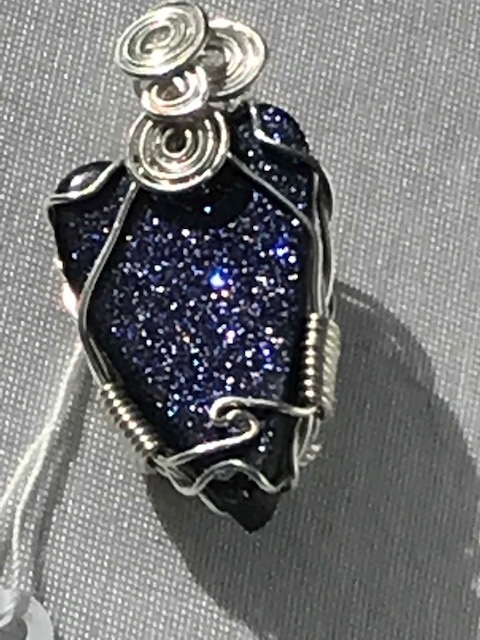 Hurry, these won't last- I have a few pair, but like the new heart shaped pendants, I don't have time to add these to the website, so email or facebook me for pics if you can't make it to a show. 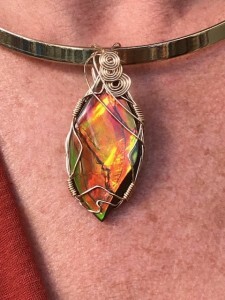 Again- watch facebook, I am trying to make more time posting new pieces and information on the facebook and pinterest platforms, I understand some people would rather connect on social media than a newsletter, so I am trying to change with the times and give you what you want! 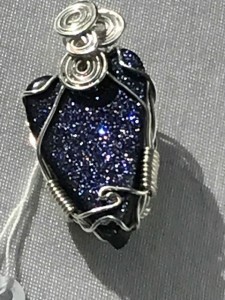 Prices on the new pendants vary, and the new heart shaped rhodochrosite earrings are $35 a pair- the ear wires are sterling as well as all my wire. The new "Florida Fish" I made over the summer are starting to find good homes! 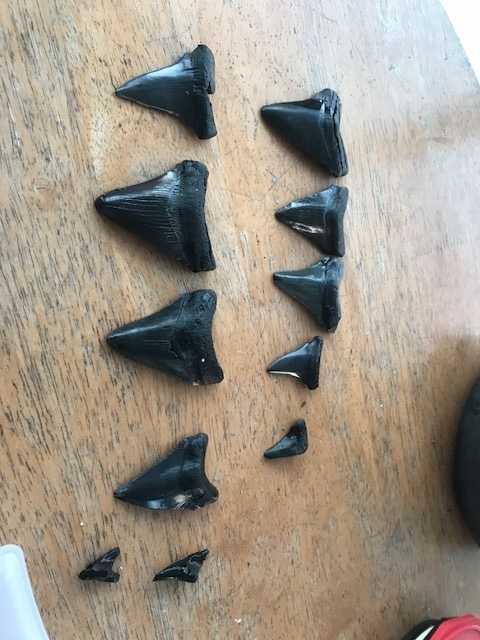 Lol, these are a nice gift from Florida for some one that loves to fish, or just enjoys the "salt life". 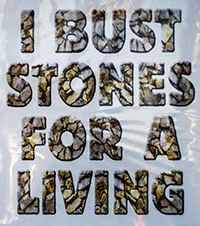 I have many new pieces, and I am trying to keep up and make more inventory each week. 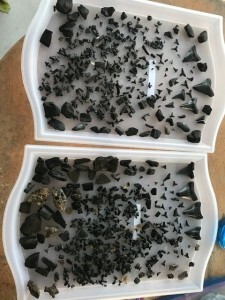 I got some great rough at the big gem show in August, so I did manage to cut some of it before season started. There are new sparkly, shimmering goldstone and blue goldstone pieces, lots of scenic picture jasper pendants, and some really beautiful ammolite pieces. I've implemented a few new display changes too, trying to add more dimension, I found some shelves I like, I think placing the neck displays up on the shelves as well as the mannequinns on the tent legs will draw your eye to my display more. And I bought a new awning! 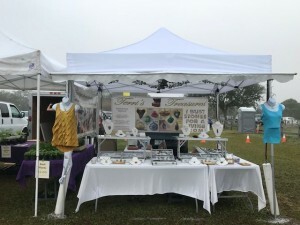 This allows me to bring my tables all the way to the front of my booth, without having the sun beat on the glass display cases all day. A few more changes taking place; I have decided to drop my Tuesday market, it was not working out for me. I am looking for another venue, but we are in the middle of season, so I am not sure if I will find one- stay posted with me on Facebook, I will let you know when I find something, Also I have to change the postage on my website, there has been another increase, and I always wait for one or two before i do this- they have gone up to $7 for priority mail, so I will reflect that soon on my site. In closing, I'd like to say thank you again for your patronage, I appreciate my customers, and I'd like to do things the way you prefer- so please- send me some feed back; is a quarterly newsletter working for you? Are you connected to my Facebook page? Do you prefer Facebook communications? How many of you follow me on Pinterest? I'd love to hear from you! TREASURE THE REAL GEMS IN LIFE!